And a break for news. Back in February we learned Twickenham Film Studios, many times a character in Beatle films and promos and one of the famed villains in “Let it Be,” was slated to close in its 99th year. Today we learn a “mystery buyer” has put down a 10 percent deposit to keep the studios alive, just a few weeks after a pair of different buyers withdrew their offers — the first one after local residents opposed the developer’s plans to build a housing complex on the site. Gerald Krasner, from joint administrators Begbies Traynor, told Sky News a mystery buyer exchanged contracts with them on Friday and they have received a 10% deposit. He said the building would continue as studio facilities with all staff jobs secured. A statement released by Begbies Traynor added: “It is envisaged that completion will take place later this year. Staff at studios say they are “delighted” at the news but Maria Walker, who started the petition to save the studios, is wary. I’ve been thinking about the oft repeated question – after releasing The Beatles and the single Hey Jude so recently, what was the hurry that led to the Let It Be sessions, and what was the rush to the vague plan of a live show? I think I may have an answer. It’s well known that during The Beatles sessions, Ringo walked out. After his return, he is on record as saying that they went into a little room and did some numbers almost ‘live’ – that is, like all playing without waiting for drums like seven days later, etc. My theory is that Ringo’s initial enthusiasm for them all playing together live in the studio – like in the old day (“Get Back”?) 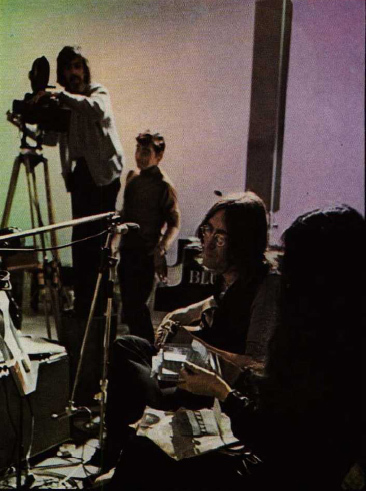 was the impetus for the stripped down recording idea of the Let It Be sessions, and probably the spark that led to (probably) McCartney pushing the live show angle. Terribly slow reply here — first off, thanks for reading! That’s an interesting theory I’d never thought of. The fact that they never had any reason at all to get back in the studio, right there in the middle of winter, with not only a double album but also hit singles all fresh certainly never made sense to me. But the more I look, the more I see it’s just what they did. Certainly in the early years, the record company pushed them, especially to have something new to tour with. But even in and after ’67, when they abandoned the stage, they stuck with the formula. — They started working on Magical Mystery Tour tracks two months after Sgt. Pepper hit the stores. (They were already working on some “You Know My Name…” and “It’s All Too Much,” and “All You Need is Love” had already been recorded and released, but that almost doesn’t count given its charitable nature vs. them needing to get a new record out). — Of course, “Let it Be” wasn’t even yet edited when they went back to the studio for Abbey Road. The single “Get Back/Don’t Let Me Down” came out three days before John & Paul recorded “Ballad of John & Yoko,” which came out weeks later while “Get Back” was still No. 1. AND that’s also when they started recorded Abbey Road. So basically, they’re workaholics. If they’re not recording, it seems they don’t know what to do with themselves. So I’m beginning to come to the mind of, it’s January 1969, sure the White Album is No. 1 and “Hey Jude” is No. 1 — but what else are we going to do? They must have realized they were four men at their peak, why not maximize. At least that’s what I’m coming around to thinking the more thought I put to it. As for doing the live show — I do like your idea, and I do look forward to listening to more of the tapes to see what kind of vibe Ringo gives off.